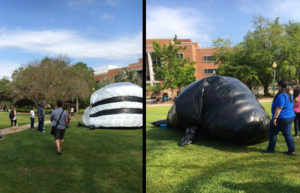 On Thursday, March 30th, 2017 11 students in Anne Stagg’s 3D Foundations class unveiled large-scale inflatable structures on Landis Green. Two groups of students collaborated to make a traveling museum and a beached pilot whale with a skeletal structure inside. 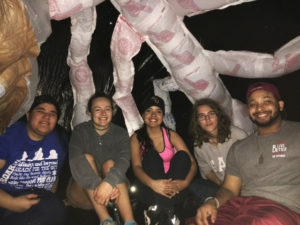 The students first determined the structural 2D net for their 3D forms and then seamed together reclaimed and new plastic to create their final structures. Each of these structures held a surprise on the interior for those who ventured inside (and many did)! The museum held 5 ironed plastic replicas of George Milton’s paintings. Milton was an FSU Anthropology professor and prominent Tallahassee painter. He is the late uncle of one of the students in the class. The interior of the whale revealed the skeleton (ribs and skull) inside. Students were compelled by the mass beaching of whales earlier this year. Additionally tiny pin prick holes in the black plastic structure on a bright sunny day created tiny projections of sunlight, lending an unintended astral feel to the interior. Both structures were inventive and fun to enter.